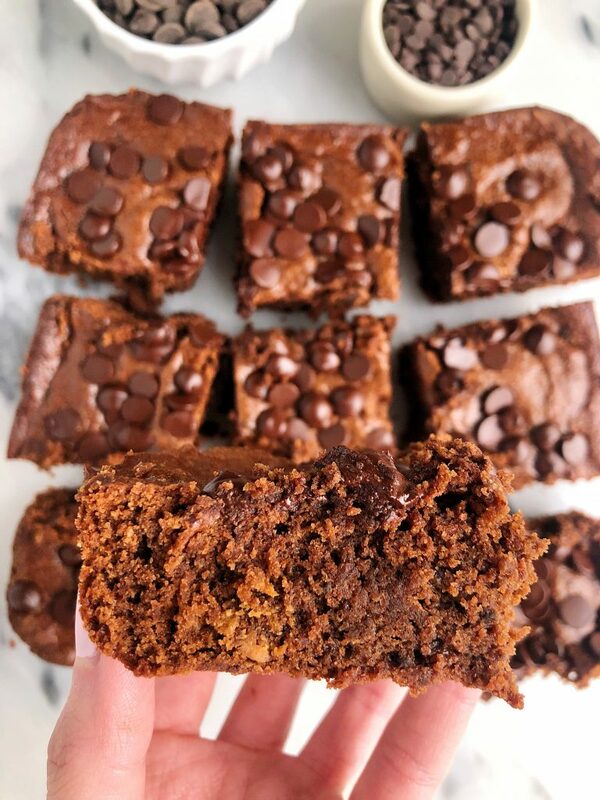 Grain-free Chocolate Chip Brownies made with almond butter, almond flour and all gluten and dairy-free ingredients and friendly for Passover! I am pretty sure many of my recipes are also Passover-approved but since it is right around the corner, I wanted to make something especially for the holiday. I am never into the desserts served at the seder that are store bought. They end up tasting like cardboard in my opinion and after my dinner, I want and crave something indulgent and rich and goooood. 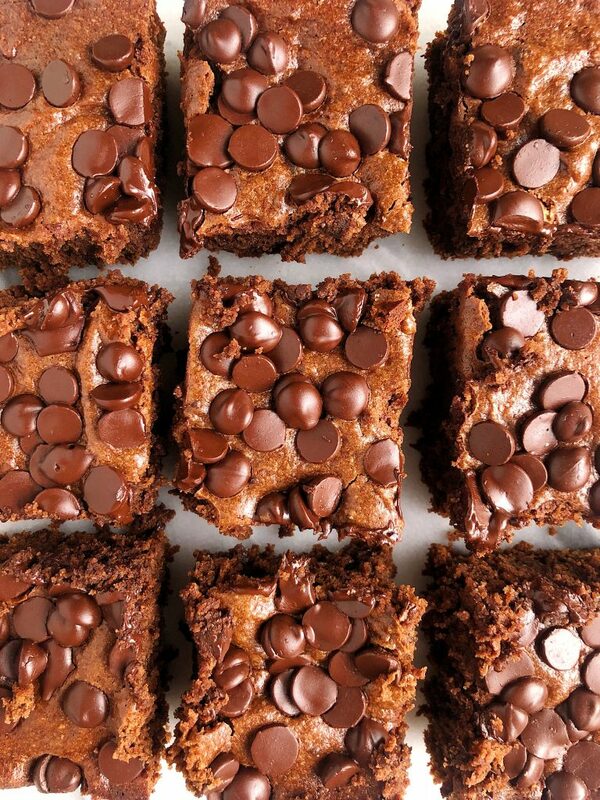 These Grain-free Chocolate Chip Brownies are just that. 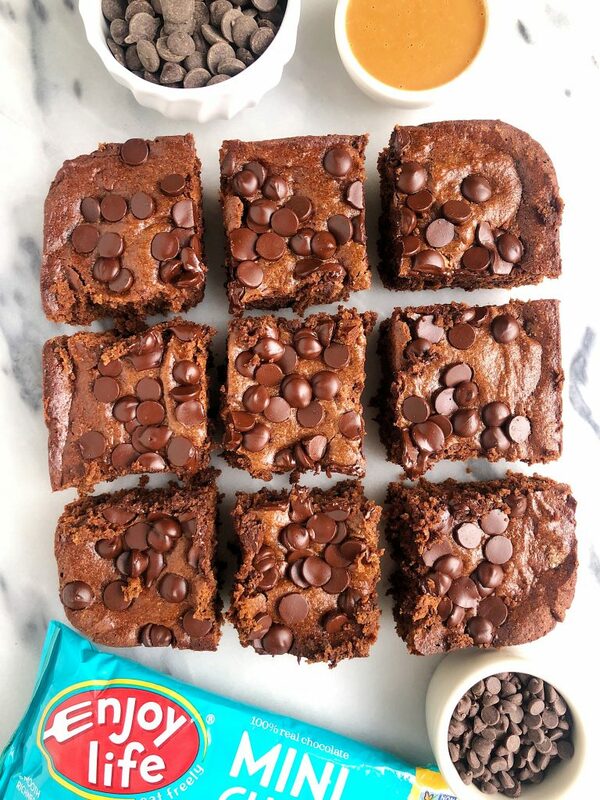 They are made with wholesome ingredients like almond butter, eggs, sweetened with maple syrup and they are filled with Enjoy Life Foods Dark Chocolate Morsels for the ultimate fudgey brownie. I made these brownies on a whim when my Mom put me in charge of dessert duty for our family’s seder. Ezra’s first Passover and granted he can’t taste these but I like to think he will through my milk supply 😉 I cannot wait for one day when he can actually enjoy some treats with me. Whether you are celebrating Passover or Easter or just find this recipe in the middle of the year, I promise this brownies will satisfy your chocolate craving and sweet tooth. I love that they are made with just a few ingredients and they are dairy-free, gluten-free and grain-free. Adding in Enjoy Life Food’s Dark Chocolate Morsels really just tops of the recipe in my opinion. The mini semi-sweet chocolate chips or chunks also work for this and they melt so perfectly in the oven. By now you guys are familiar with Enjoy Life Foods and how much I love baking with them. I have been sharing a handful of recipes on the blog using their baking chocolates over the past few months and they have been some of your favorite recipes yet. This makes me so happy to see! In case you are new around here, Enjoy Life Foods makes a variety of allergy-friendly products ranging from baking chocolates to baking mixes, snacks and more. They are free of the top allergens and are a go-to around here. I hope you guys love these brownies as much as we did! Slice them when they are still a little warm and top them off with your favorite ice cream for a little brownie sundae option. I am salivating just thinking about it. Bake in oven for 32-35 minutes then slice and enjoy! Thank you Enjoy Life Foods for sponsoring this post. It means so much to me to partner with brands I love and believe in! Can you refer to which other recipes are K for P? Thanks! Halved the recipe and made them in a muffin tin. SO GOOD. It will be a miracle if I don’t eat the whole batch in one night! !